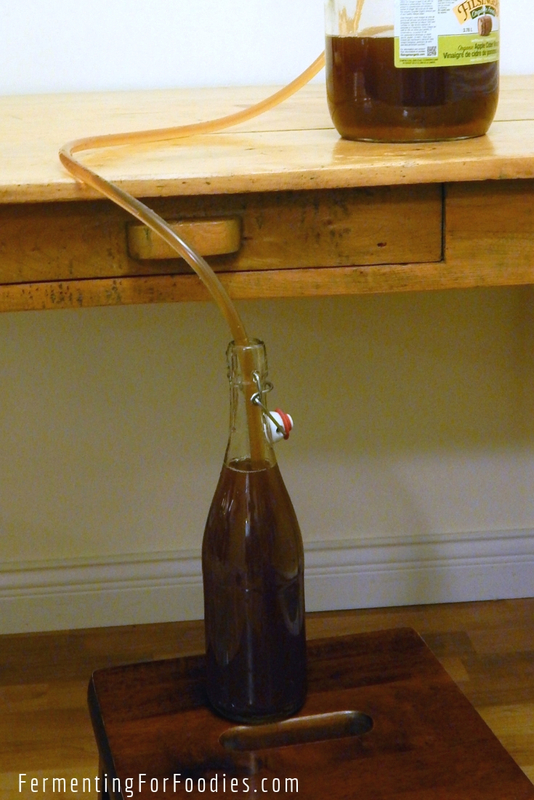 It is a relatively simple process to turn fruit into homemade wine and cider. 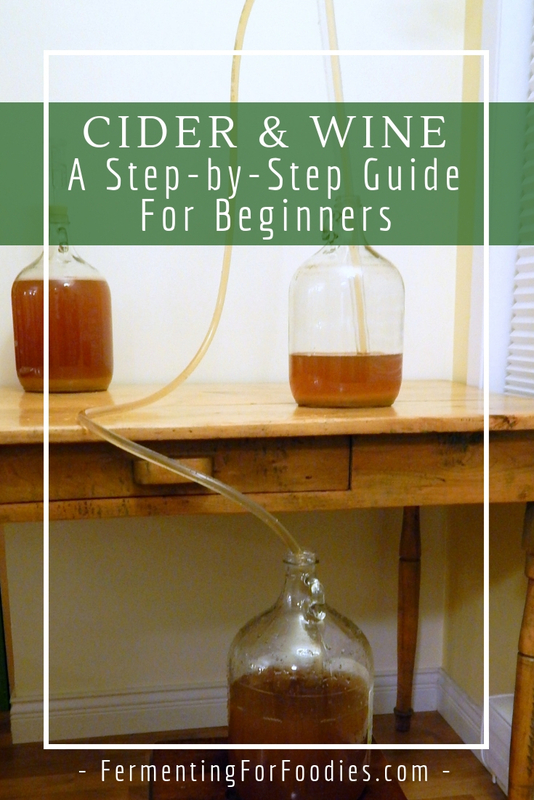 Here is a detailed description of how to make wine and cider. See the Cider and Wine Overview for detailed information on equipment, ingredients and sterilization, as well as links to recipes. Always start by sanitizing EVERYTHING. This step is THE MOST IMPORTANT part of making homemade cider and wine. It’s the only way to make sure that you have a delicious alcoholic beverage and not methanol-moonshine. While most wines start with a primary fermentation of a fruit mash, there are certain circumstances when it’s better to start with juice. Hard fruits like apple and pear are better when made with pressed juice because it is difficult to extract juice from the fruit mash. , Cabernet Sauvignon) then you should start with wine making juice. White wine always starts with just juice, otherwise you end up making something like a pinot noir. 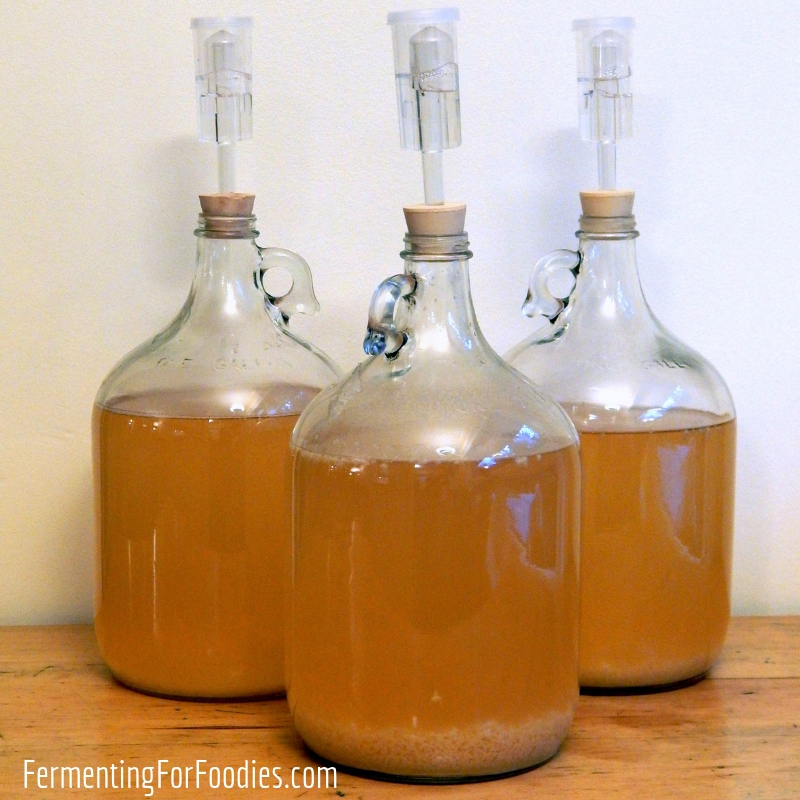 Primary fermentation with juice is very simple. Mix the juice with sugar, yeast and additives, according to your recipe. Put it in a fermentation vessel. Leave it somewhere cool to ferment (approx 15 C / 60 F to 23 C / 75 F). If it’s too warm, then the fermentation process will go quickly and the resulting drink won’t taste as good. It will bubble in the airlock for 2 weeks. Let it sit for one week after the bubbling as stopped before racking. Pour boiling water over the fruit (or use campden tablets) to kill any existing bacteria and molds. Gently crush the fruit into a mash. Mixed in sugar, yeast and any other additives. Cover the mash with a tea towel to prevent fruit flies and ferment for up to a week. The mashed fruit will float, so stir daily with a sterile spoon. into another large pot. Remember to keep everything sterile! It helps clarify the wine by filtering out dead yeast and leftover fruit. It allows you to test alcohol and acidity to determine if you need to make adjustments. 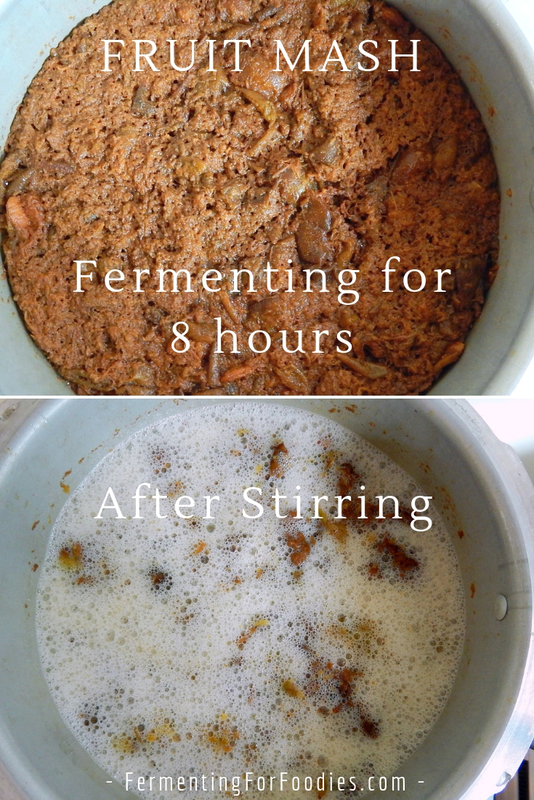 If the fermenting stalled early, then you can add yeast energizer to kick-start the fermenting process. Allows the wine to age for another few months. Wine can be racked 3 or 4 times to get a really clear product. Cider is generally only racked once before bottling. The only trick to racking is to prevent oxidation. So siphon the liquid into the bottom of the jug and try to prevent splashing. As long as conditions are right, yeast will keep fermenting until all of the sugar is gone or until the ferment reaches alcohol levels of around 17%-20%. The exact alcohol-level depends on the strain of yeast. For example, wild yeasts usually die off at 5% alcohol, but champagne yeast is about 20%. Dry red wines will naturally stop fermenting when all the sugars have been used up. Sweet fruit wines may also prematurely stop fermenting because they don’t have enough nutrients to feed the yeast. 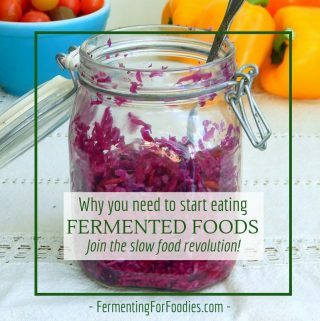 Refrigeration will slow down fermentation. This is a great way to finish off cider without sulfites. Once the cider once it has carbonated, stick it in the refrigerator and consume within 6 months. 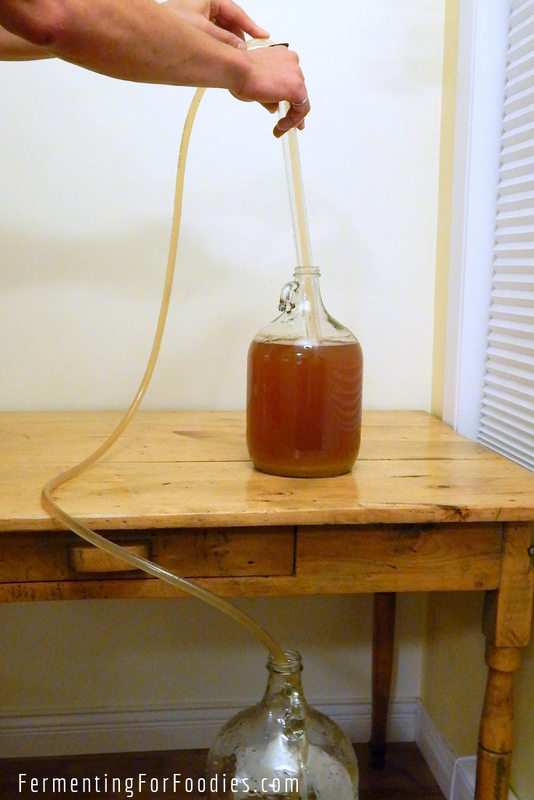 during the racking to kill off the remaining yeast. If you want your cider to be sparkling, then you need to add more sugar at bottling time so that the residual yeast can ferment the sugars. At that point you will need to age it for at least 2 more weeks before drinking. You will need to store your cider in plastic bottles or swing-top bottles that are built to handle the build up of carbonation. If you are doing a large batch of glass bottles, do at least one plastic bottle so that you can test the carbonation by squeezing the plastic bottle to see how firm it is. Once the carbonation has built up, store the cider in the fridge to prevent it from fermenting. You don’t want your bottles of cider exploding before you get the chance to drink them! White wines and fruit wines generally age in the carboys for 3-6 months before bottling, and red wines age for 6-12 months. During this process should rack the wines several times, leaving behind all the sludge at the bottom of the fermentation container. When it is finished fermenting you can bottle the wine in the traditional glass bottles with a cork or in swing-top bottles. Age will dramatically affect the flavour of your wine, so taste it when you bottle it, to determine if it’s ready for drinking. If not, then leave it for another few months before tasting it again.